People really weren't joking about that whole "April showers" thing! It seemed like it rained for most of the month, which was such a bummer. 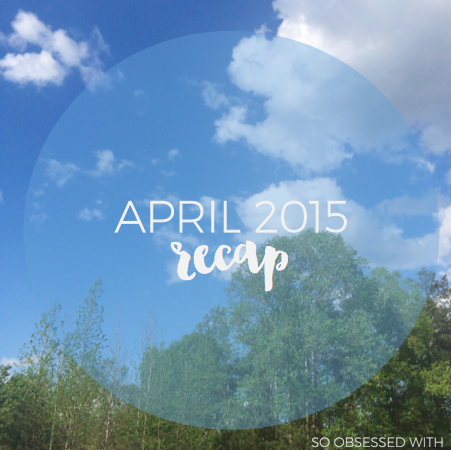 But it turned out to be a great reading month, so I was happy overall! 1. #NoSpendApril - In March, I went a little crazy with online ordering. I spent too much money on crafting supplies because I'm a #FoxyDoriAddict. But I was determined to clean up my act in April! Cassie suggested doing #NoSpendApril, and I decided to join. I'm so proud to say that I stayed on track for the whole month! 2. Dinner with Lindsey - Back in March, Lindsey mentioned that she was road tripping in April and would be spending the night in a city near me. When she suggested meeting up, I was sold! I had so much fun getting to know her and am excited about finding a new friend. Dinner was delicious, but the company was even better. 3. Watercolor Gift - One of my favorite people at work surprised me with an adorable and hilarious gift: a watercolor of my dog, Jackson, reading! She made it for me JUST BECAUSE. I almost cried when I saw it, and I've already picked out the spot where it's going to hang in my office/library at home. She's so talented! 4. Surprise from Rachel - I received the loveliest and most thoughtful surprise from Rachel! This picture doesn't even do the gorgeous Audrey Hepburn mug justice. And that's a Peeta candle!!! DO YOU EVEN KNOW HOW MUCH I FREAKED OUT? I love finding people who share my obsessions, especially for Audrey and Anne! "Instead of trying and failing, Delia never tried. It was fear, cloaked in rationalisations and self-deprecation." "We're scared of all sorts of things that won't kill us, aren't we? The things we live our lives around avoiding. what we should've been afraid of was a life lived by avoiding things." “Yes it can. Because we always have a choice, even when it feels like we don’t." 1. Quarterly Historical Fiction Round-Up by Lindsey from Bring My Books - When Lindsey told me she was thinking about this new feature, I was thrilled. I love historical fiction, but I feel like there's not enough on my radar. Thankfully, this post can help! Lindsey has rounded-up the best from January-March. 2. Building Better Relationships by Cass from The Casserole - I love reading posts about friendship, and this one was particularly timely. Every single relationship - whether with friends or family and whether near or far - takes work. But it's so worth it! Cassie's post was such an important reminder of that fact. 3. Twenty-Seven Lessons I've Learned... by Jen from Pop! Goes the Reader - In addition to the lovely graphics, I just adored the sentiments expressed in this post. In honor of her 27th birthday, Jen talks about the things she's learned over the years. I can relate to so many of these lessons and love the wealth of wisdom she shared. In April, my obsession changed from Mat Kearney to James Bay. I listened to this album more times than I can count. I'm in love with his voice! The Longest Ride (2015) starring Britt Roberston, Scott Eastwood, and Alan Alda - While I'm not the biggest fan of Nicholas Sparks' books, I do love the movie adaptations of them. (Well, aside from Best of Me. That was awful.) I've been dying to see The Longest Ride since I first saw the trailer, and thankfully it lived up to my expectations. Scott Eastwood is a total hottie! And I really loved Oona Chaplin and the historical story! Grey's Anatomy, Episode 21 - While I thought it might happen, I was totally unprepared for the events in this episode. McDreamy is a such a huge part of this show - and Meredith's story - and I'm so sad that this is how his story ended. I watched this video at least five times to wallow in my sadness, and now I want to start re-watching the show from the very beginning. It can be a mess at times, but I love this show. Aww, I love Audrey Hepburn, too! What a cute mug. :) I read my first Emery Lord book this past week ... it was okay, but I'm eager to try The Start of You and Me. And I still haven't seen a Nicholas Sparks movie other than The Notebook ... for a romance lover like me, I probably should watch some more! JAMES. BAY. Yes to all. YES TO ALL. I've been dying to see The Longest Ride. Like you, I'm a Sparks movie fan, but not a book fan. His writing isn't for me, but clearly he's got something in the stories. This looks different from his other ones...was that the case? Love that you and Lindsey got to meet!! Yay for #NoSpendApril! That's awesome that you stayed on track. I need to do that one of these months. Lady Thief!!! I'm glad you liked it! And ACOTAR :D I'm still dying to read The Royal We. I want to watch The Longest Ride! I have a feeling I'll have to wait for Netflix and an early morning with Andy haha. But it sounds so good! And dude, Scott Eastman is a TOTAL hottie!